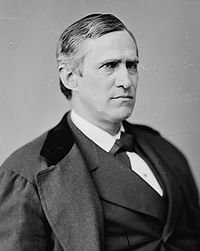 English: Thomas Francis Bayard (October 29, 1828 – September 29, 1898) was an American lawyer and politician from Wilmington, in New Castle County, Delaware. He was a member of the Democratic Party, who served three terms as U.S. Senator from Delaware, and as U.S. Secretary of State, and U.S. Ambassador to the United Kingdom. He was considered a prominent Bourbon Democrat. Media in category "Thomas Bayard"
This page was last edited on 7 February 2019, at 19:51.